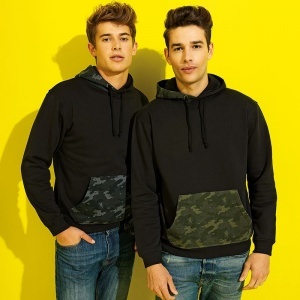 The men's camo trimmed hoodie is a regular-fit popover hooded sweatshirt and a Asquith & Fox casualwear hero. With camo detailing to the hood and a handy kangaroo pocket for added measure. Hello new comfiest first choice. Classic fit hooded sweatshirt. Rib knit cuffs and hemline. Contrast kangaroo pouch. Contrast panel on hood. Draw string chord on hood.